This unusual baby gift is sure to be used throughout baby�s first year. It features a set of adorable little stickers, one for each month to be used while taking a picture of the baby each month. Attached to the baby�s outfit for example, each picture will become part of the precious timeline of photos taken during their first year! 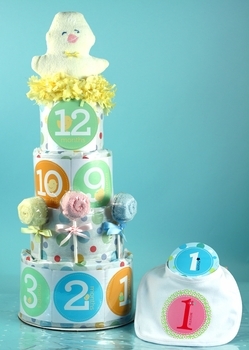 Sticker number one is ideal to commemorate the new child�s arrival while sticker number twelve is great for their first birthday. All the others can embellish the photos of other developmental milestones month by month as they grow!